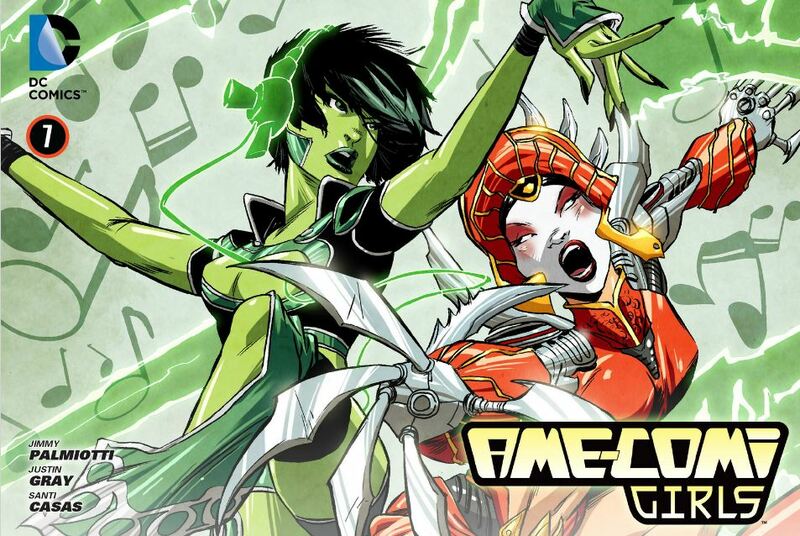 Ame-Comi Girls (written by Jimmy Palmiottie, Justin Grey, and art by Santi Casas) is in a universe of its own. Last week’s issue was heartbreaking with Batgirl and Robin’s parents discovering their identities (thank you Powergirl…) and a teaser look into the Guardians of the Universe as they chose the first Green Lantern for Earth’s sector. This issue focused entirely on the origins of the new lantern. Blinded at the age of twelve in an accident that killed her mother, Jade Yifei is an adventurous young woman from China. Her father a cop and her brother an expert climber, Jade’s goal was to climb Mt. Everest one day. When an enemy of her father’s comes to give him a message, Jade is sent falling to her death. The green lantern ring arrives in the nick of time to save her life and aid her in kicking some serious tail. The Green Lantern oath changed quite a bit, but I think it fits our new heroine. A couple of things caught my attention about this issue. The first is that Jade is a real hero not just because she wears a green lantern ring, but also because she is a young woman who is blind does not let that stop her from going after her goals and living her life. The second is that she’s from China. Most (if not all) the green lanterns from Earth in the past have all come from the United States. I’ve argued that this series has some great role models in it for girls and, in my opinion, Jade is a wonderful example of why. This series centers on strong women who don’t need some muscle bound male to save them. They save themselves and kick tail while doing it. While the body types are not realistic, I can see some of the same unrealistic body types in my Superman and Batman comic books. The outfits and artistic style of the girls reflects the artistry of the statutes this series is based on , so if you have a problem with it, maybe just relay the messages to your daughter without necessarily letting them read it. Another option is to explain that the girls are not drawn realistically and they should not read that deep into their appearance. Ame-Comi Girls is released every Monday on Comixology. For anyone looking for a reason to look forward to Mondays, this is the series for you. This series is recommended for anyone ages ten and up. 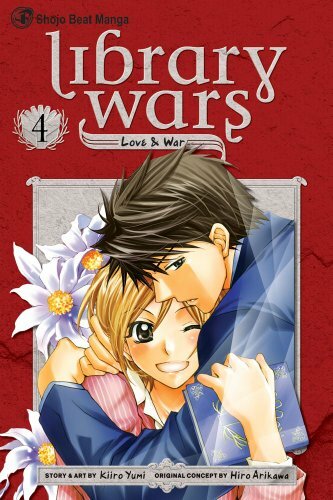 Kiiro Yumi knows how to ramp up the action in Library Wars. I’m reviewing both Volume 3 and Volume 4 because the most recent story line involves both. Volume 3 starts off with some amusing plot about two kids that are doing some censorship protests of their own. The scenes with Major Genda (really love the use of fonts!) are hilarious. But we quickly get into a new problem that involves the Director of the Library, and why he ended up in a wheelchair (The Hino Nightmare). There is a big operative that Iku assumes she will be a part of, but Dojo assigns her to accompany the Director somewhere else instead. Obviously Dojo is trying to keep Iku safe because he cares for her, but she doesn’t see it that way. And of course, everything goes crazy and Iku winds up in the most danger of all. It really is heartwarming to see how freaked out Dojo is. Ah, good romance. It’s great to see how Iku handles the dangerous situation. And finally, the identity of her “prince” is revealed. Check it out. Dark Horse Comics caught my eye with two very different announcements this week. The Fifth Beatle Image: © 2012 Tiwary Entertainment Group Ltd. The first was about The Fifth Beatle , a graphic novel and feature film combo penned by Broadway producer Vivek Tiwary ( American Idiot , Raisin in the Sun ) that will tell the story of Brian Epstein, the Beatles’ manager and friend. Epstein was instrumental in securing a first recording contract for the band and widely credited with turning the Beatles into a world-wide phenomenon that was “more famous than Elvis.” The flip side to this success was that Epstein struggled to accept his sexual orientation, and in an era where homosexuality was stigmatized and criminalized, turned to narcotics to cope, only to die tragically of an overdose at the age of 32. Slated for publication in 2013, The Fifth Beatle will be drawn by Andrew Robinson ( Star Wars , Batman , Superman ). The subsequent animated movie is set to begin production and will mark the first time a feature film about the band has ever secured rights to include Beatles songs. To keep up with news on the graphic novel and film project, head over to their website for more information. 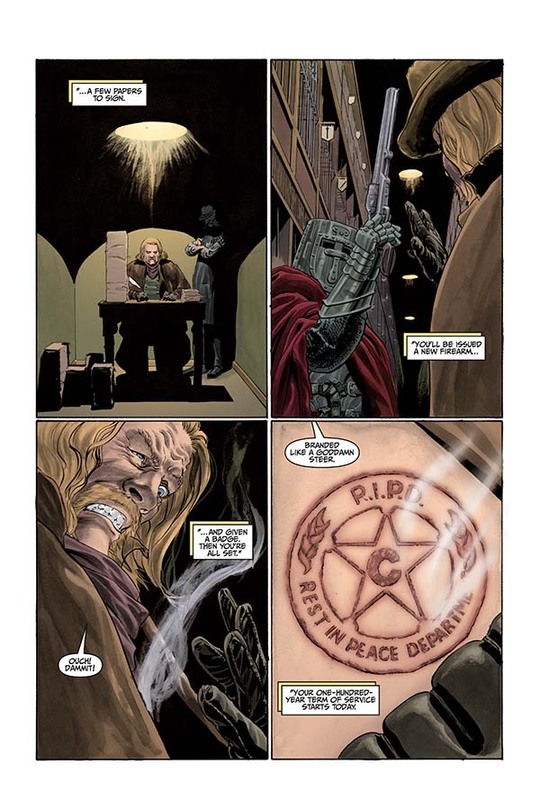 Peter Lenkov’s comic R.I.P.D. City of the Damned (released ten years ago and slated for re-release this November) is the basis for next summer’s blockbuster movie starring Jeff Bridges, Ryan Reynolds, and (yes…wait for it) Kevin Bacon. I’m already envisioning the screams, the laughter, the chewing of scenery and THE BACON-Y GOODNESS! ← Giveaway: Smart Women Vote!